JOHN FRANCIS BROWN: Militarism/Bombing (1975-76). Vintage silver bromide print. ENGLAND & CO presents a cabinet room of photographs primarily from the 1960s, 1970s and early 1980s, encompassing artists’ use of photography as a both medium and method for documentation and experimentation. Well-known artists are exhibited alongside recent re-discoveries. There is a particular focus on work by women artists/photographers of the 1970s – the concept that ‘the personal is political’ informed their practice. Susan Hiller’s Photomat Self Portrait Series is an example of self-portraiture using vernacular means. As Hiller wrote in 1972, this is “photography for everyone, even those who don’t own or can’t borrow cameras, Automatic photographic machines are available in places which are truly ‘public’ all over the world: railway stations, Woolworths, penny arcades, street corners. Everyone can take his/her own picture without the intervention of a photographer: you just sit down in front of the machine.” Later she wrote that she had started “to wonder why I wasn’t taking pictures of myself… I had been thinking about… self-image, self-presentation, self-enactment… How one’s image is then read, contextualised. This was at the end of the Seventies, when I first started doing the self-portrait series.” These various machine ‘self-portraits’ could not be more self-contained and self-referential – the subject of the portrait has the ultimate control over the image s/he presents. Anne Bean has worked as an installation and performance artist for more than 40 years, using many media, including photography, light, drawing, video and sound, together with materials ranging from fire and pyrotechnics, to wind and steam. An article in Artscribe described how Bean uses performance in “a random, protean, art-as-life way”: the collaborative photographic images recording these events evoke this powerful, elemental quality. Chilean-born, New York-based artist, Cecilia Vicuña’s ephemeral performance works also exist after the event as photographic documentation that she directed and choreographed in a collaborative process. The same process applies to the precarios, her equally ephemeral ‘street’ sculptures that are photographed under her direction so that they survive in a different medium. The series of images, Vaso de Leche, are a ‘synopsis’ of a politicized performance from 1979, distilled to its pure, potent symbolism – these images are currently on view in Radical Women at Brooklyn Museum, NY. John Francis Brown was particularly influenced as a creative photography student in the 1970s by Underground film-makers such as Stan Brakhage and Malcolm Le Grice. Brown’s series of Experimental Narratives from 1977, are photographic works constructed by his assembling and contact-printing four images together in seemingly random combinations. This process creates unsettling narratives by association: these are images as ‘psychological events’ akin to Victor Burgin’s ‘psychical spaces of fantasy and projection, recognition and misrecognition’. Brown’s Experimental Narrative (Head in Oven, Phone & Lamp) and Experimental Narrative (Suitcase, Rock, Plant & TV) are both represented in the Government Art Collection. Barbara and Zafer Baran are photographers who have worked together since meeting at Goldsmiths College in 1981. They are particularly known for their camera-less photography of the past two decades that has been exhibited and collected internationally, featured at London’s Victoria and Albert Museum and even reproduced on British postage stamps. At Photo London, England & Co will exhibit early analogue photographs by the Barans from the early 1980s: works they produced individually and also from their first collaborative series made in Turkey in 1982. Barbara Baran’s Natural Histories series from 1983 references John Berger’s ‘Why Look at Animals’ (1977): “The image of a wild animal becomes the starting point of a daydream…”. Zafer Baran’s series Seven Days in Norfolk is represented by the set of eight vintage prints that make the panorama: Day Four, Woods (Inner Square Panorama), June 1982, which is exhibited here for the first time. This work was conceived as a photographic sequence that documents an impermanent site-specific intervention on the ground in Norfolk. John Aldus, aka Gérald Ducimetière, documented and recorded the light and light sources in a house in rural Italy in Lumière/Lumières (1972): postcards inscribed with map references, together with sequences of small photographs of the changing light in each room provide poetic evidence. The late British artist/photographer Sue Barnes explored feminist themes about self-identity, family, and ‘the home’ in the 1970s and ’80s. Her domestic environment and her own ‘self’ were her major concerns and themes. She worked in photographic series: numerous self-portraits were made in her London flat, including a series where she is naked in her bath with plastic creatures, making play with Surrealism. Other series use repeated images of domestic objects or images from television, sometimes also incorporated into hand-made artist’s books as a method of presentation. 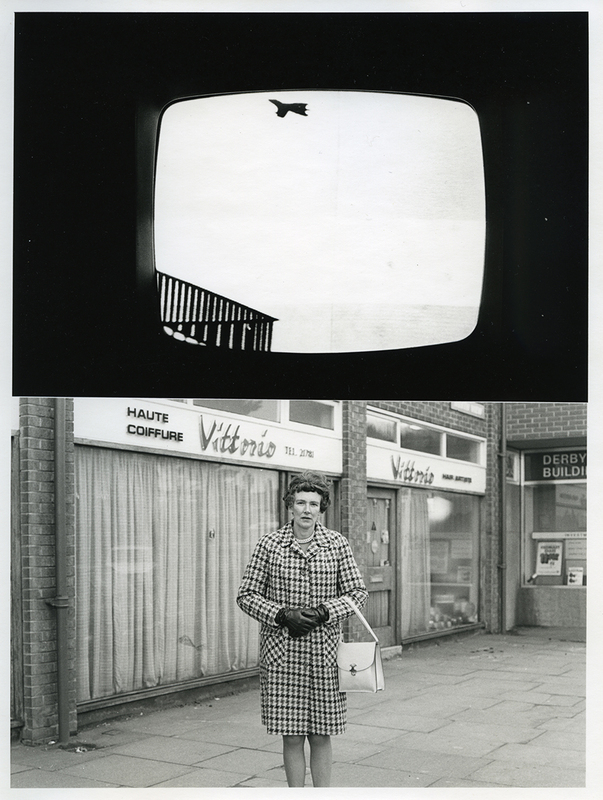 Tina Keane’s She documents her major performance work at the Hayward Gallery in 1978: “In She, transparencies of neon signs, words of a short poem and shop windows are projected onto a wall and I use the area in front of the images to perform. At the same time a video camera records my image on to a monitor, reducing my movements and size, bringing into play the actual and the recorded, the shop dummy, and the person, the illusion and the reality.” Keane’s works reflect a feminine aesthetic that combines femininity, gender roles, sexuality and an element of play. Political and subversive themes helped British-based Michael Druks establish an international reputation in the 1960s and 1970s for his highly original conceptual work incorporating performance and photography. Works from Druks’ Flexible Geography series were exhibited at Gallery House, which was one of London’s most influential art spaces in the early 1970s. Howard Selina also exhibited at Gallery House, and actively used photography in his land-art works and performative conceptual works of the 1970s. In The Life Line Piece from 1972, he documented a land performance/intervention in a set of nine photographs. Clay Perry documented London’s avant-garde in the 1960s: he photographed Yoko Ono at her early exhibition at the Lisson Gallery; and was in-house photographer for the experimental Signals Gallery run by David Medalla and Paul Keeler from 1964-66. His portraits of artists, such as David Medalla, Mira Schendel and Yoko Ono are now iconic images.